Approximately 40,000 junior bondholders are about to take a huge hit as a last-gasp private rescue plan for Monte dei Paschi, the world’s oldest bank looks set to fail. 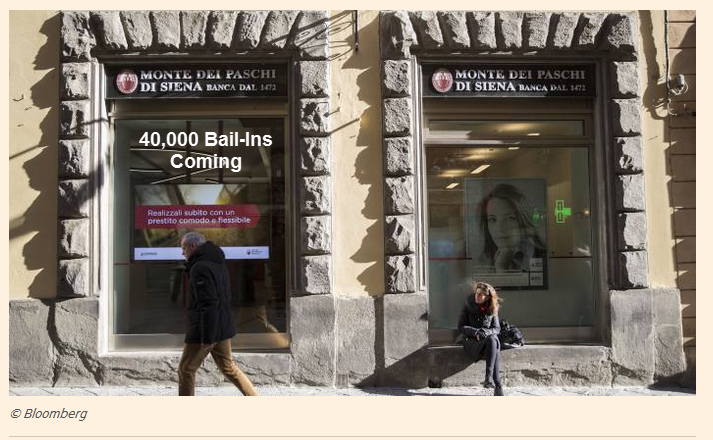 Please consider Italy to Bail Out Monte dei Paschi di Siena Bank. Monte dei Paschi di Siena is to be rescued by the Italian state using a new €20bn bailout package, as a last-gasp private sector rescue plan for the world’s oldest bank looked set to fail, forcing losses on bondholders. The government rescue, which had long been resisted in Rome, is designed to draw a line under the slow-burn crisis in Italian banking that has alarmed investors and become the main source of concern for European financial regulators. Shares in MPS were suspended on Wednesday morning after the bank, Italy’s third-largest lender by assets, warned that its liquidity levels were deteriorating rapidly. People close to the bank said small and midsized companies had been pulling deposits. Rome and Brussels have been in talks on ways to structure the bailout of the bank in a way that compensation could be offered to an estimated 40,000 retail holders of junior debt that may suffer losses based on new EU rules. A sale of €28bn in bad loans demanded by regulators is also in doubt and may need to be renegotiated, said two people involved. MPS, which has already burnt through €8bn in new capital since the financial crisis, is expected to receive the state funds under a “precautionary recapitalisation” agreed with EU regulators under its new banking rules. The Five Star Movement, the main anti-establishment opposition party led by comedian Beppe Grillo, opposed the measure, calling for a full nationalisation of struggling banks. A backlash against a taxpayer-funded bailout of Italy’s weakest lenders has already begun. Codacons, a consumer lobby group, estimated €20bn ploughed into Italy’s failing lenders would cost each Italian family €833. Italy approved a €20 billion bank bailout. 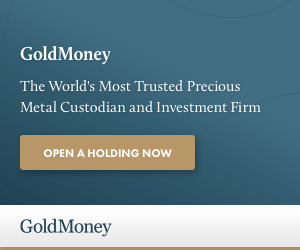 Goldman estimates €38 billion is needed. Given there is something on the order of €260 billion in nonperforming loans, I speculate €120 billion or more may be needed. One thing is sure: €20 billion is not nearly enough to close the gap. Here’s the question that needs to be addressed: Realistically, what are those non-performing loans worth on the open market? Taxpayers and junior bondholders are on the hook. This begs the question: why are not senior bondholders on the hook before taxpayers? Regardless, this bailout/bail-in is guaranteed to help Beppe Grillo and his band of eurosceptics. US taxpayers have been forced to do a bail-in of Government Motors / UAW at least five times in the last 40 years. Everyone knew the minute Mario Draghi promised to ignore moral hazard theory that there would be lots of big bank failures. 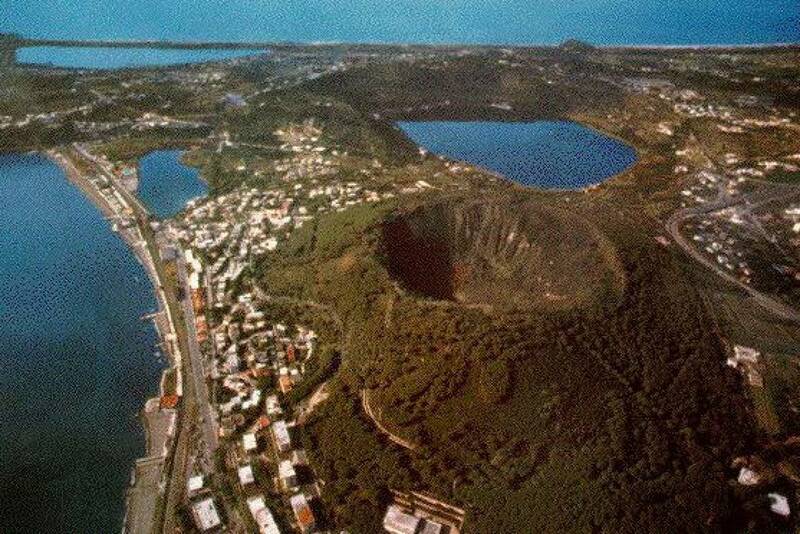 The perfect distraction – Campi Flegrei Supervolcano is making lots of noise. Perfect timing for a mass confiscation. 20 billion euros is 833 euros per italian family. That means 120 billion would be 4998 euros per italian family. I am thinking it will cost much more. If Italy saves the banks then the countrys own debt levels will become totally unmanageable. ECB and Germany probably will not save them. That means the only solution is Italy leaving euro and returning to their own currency Lira with a floating exchange rate decided by markets if they have any sense. Italy needs its own central bank funding banks with as many liras as necessary and jail sentences and unemployment for bankers who have given stupid loans. Do an Iceland! The only country that demonstrated real courage during the last financial crisis. At least it’s not as bad as an Ireland, (guarantee all the bondholders). We’re still FUBAR from the old rules. Two possibilities to my view. Either foreign creditors are securing hard assets for if Euro dissolves, or there is a larger calculation. Whichever, the banks are being ransacked and merged to a new command, one that can write the rules along the way. Spain is an example of how extensions are achieved, Greece and Cyprus the opposite, though they are still ‘going’. In Spain every attempt was made to repackage assets, to sell them on fraudulently to the public or via high level connections, with minimal accountable government involvement ( as in deficit). They wrote in resolution of accounts for fifteen ( if I remember) years time, made steady losses on government funding since, sold off junk banks by underhand commercial means to the public, etc. etc. etc.. The country is still hanging within ‘non failure’ as opposed to Greece. Ongoing, and it is set up to be, how it is when countries play along, though I expect the country and public are getting screwed over. I don’t know exactly what will happen in Italy, full arrangements are only announced after the typical crisis encounters. One note on Spain, according to https://www.gurusblog.com/archives/cuanto-dinero-debe-banco-desde-el-principio-por-la-clausula-suelo/21/12/2016/ Spanish banks face a 30bn tab in arrear payents for having set floors to mortgage rates. You forgot to mention that returning to the lira would inevitably entail defaulting on government debt: the foreign portion of it could not be serviced with liras. The domestic bondholders, apparently a good part, would not be spared, either. Going back to the lira is the last thing before committing suicide. They’ve already committed suicide. Might as well piss off the Germans before they check out. The Italian economy is as failed as its banks. Ditto for Greece, Spain & Portugal. Is Deutsche Bank going to make it? How many banks have to fail before the stock market gets a clue? Steve I cannot do the “like” so I will give you a “like” here. You can bet that the majority of the loans those Italian bankers made for under 10 million included massive kickbacks to the loan officers, the more they wrote the more they made. Ivory tower economists convinced bankers to lend to the private sector for the construction of Keynesian pyramids. Bankers apparently didn’t understand that such loans are toast. Those that did understand it, didn’t get promoted, as they didn’t contribute nearly as much to the bottom line as those who did not. It’s endemic all over the West in the age of financialization. It’s always been true that the scum rises to the top, but over the past 40-100 years, it has become equally true that the dumb rises to the top as well. I read once that it’s not that capitalism is the best, but more like it is slightly better than the rest. Here is the perfect example. Stuck between bailout/in and nationalization. Sure one can make the point that bailouts are not part of capitalism theoretically, but empirical evidence says otherwise, companies have been bailed out/in for a very long time in the US and in europe even further back. The problem with Italian banks, is that there is a solution for them, but one that Italy would reject, and that is letting other european banks or american ones acquire them. Europe has too many banks as it is, the situation is similar to the US before banking became a “respectable” business, when banks could not do business across state lines. Similarly in Europe every country have their own banks, and even though there are no legal restriction in place to prevent banks to expand across countries within EU, there are nationalistic tendencies that work just the same to prevent it. The reason Italy would reject such a merger is that these banks are the historical financiers of Italian politicians and their adventures, from dictators to colonization of Africa and Arab countries and so on and so forth, to the modern times, many of the families who control major stakes in these banks are in part and parcel of italian politics. These banks are political leverage of these countries, giving them up means being a less powerful country according to their reasoning. Bailout/in the only option, or give Beppe the government, banks, probably the auto industry as well, and pray that italy doesn’t wake up one morning in Caracas or worse still, one morning in Caracas the other in trump tower. It’s black and white: if you live in a capitalist system there are simply no bailouts. Period. Likewise: in a true democracy you either have ‘free speech’ or you don’t. In most Western countries now you have this retarded ‘Hate Speech’ legislation. The moment you introduce that you don’t have ‘free speech’ any more. Free speech ‘with conditions’ isn’t free speech. Period. The peons will never understand this until it’s too late. They are doing it to limit available roots of criticism of the EU. They don’t realise that when you do that you find yourself with a population with only one valve left to vent via – the worst one – pitch forks etc. They will bring upon themselves that which they wish to a ovoid at all costs. I don’t like to deal in absolutes it’s always a lost cause. Except in mathematics, and absolute philosophical truths ie 1 + 1 = 2. Whereas when we humans are concerned if we deal in absolutes horrible things happen in the world. . At one point or another in history capitalism was established as it is theoretically prescribed, and it worked for a time, and this is where it leads. Our time is it’s end result. There is nothing wrong with that though, it doesn’t have to be perfect to be accepted. It can be improved as with all things human. Humanity has always improved on ideas and found better ways for social progress. “Your rights and liberty end where other people’s rights and liberties begin”. Going back to subject, I am not saying a bailout is a good thing though, perhaps i wasn’t clear enough. Simply that considering the alternatives i don’t think they will chose another route given their track record. Yeah, why is that? Who are these senior bondholders? The senior subordinated debt (aka “lower tier 2”) is now trading at 46 cents on the dollar. Basically, the market expects these securities to receive restructured equity alongside the govt’s bailout equity investment equal to 46c or more. Plus the govt is rumored to be giving 80c to any retail investor of the subordinated bonds. Outrageous! Even subordinated debt isn’t being wiped out. I should point out that MPS has historically been affiliated with Renzi’s party, so who knows if some of his buddies are in these bonds. I made the comment below before reading this. Off course, when taxpayer money is expected and the well connected know it, the “market” prices will be different. How come billion are in non performing loans when total loan book for 2016 consolidated statements are 120 billion. Are these off balance sheet? A bankrupt country is going to bail out a bankrupt bank. I don’t see a problem. Keep calm. Everything is under control. Nowhere am I reading about the wholesale replacement of this incompetent management team. This is what really needs to happen. But can-kicking will be the preferred modus operandi until the day when it stops working. Then things get really ugly. These bonds must be worth pennies to the dollar, so bailing them in just puts them out of their misery. Junior bondholders are supposed to be second in line to be wiped out, right after shareholders.